can be applied to bottles and containers for various uses. The open information of international publication of our patents (WIPO Patentscope) is here. The patent has been granted in Germany. You can see "DPMAregister" pages from the links below. For the information about patent status in other countries, please e-mail to contact@gentlelock.net. 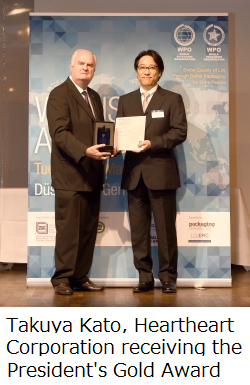 Congratulations on WorldStar 2015 President's Award. I heartily congratulate winners of "WorldStar 2015 President's Award". 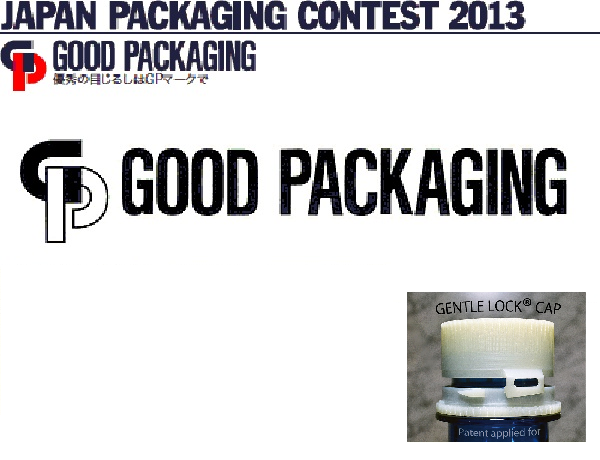 The gold award winner "Locked4Kids" and all other winners have developed excellent products, and World Packaging Organization has been leading activities which contributing to people in general and society. I am proud of them and respect them deeply. Takuya Kato, CEO & Founder, Heartheart Corporation. 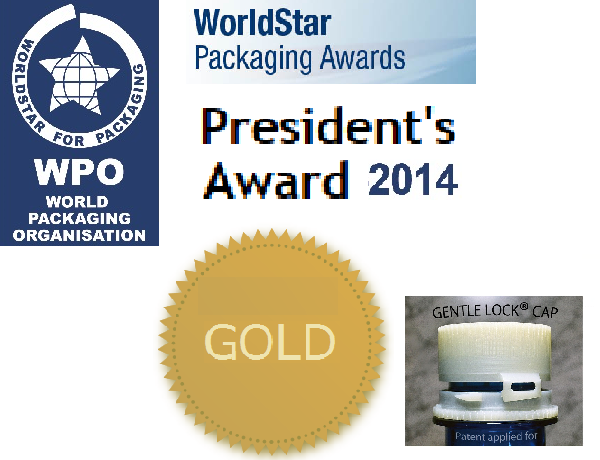 GentleLock® Cap has become one of WorldStar Award winners in "WorldStar 2014 Awards(*)" and also was awarded President's Gold Award, the best prize. We express again our deep appreciation for the warm and valuable assistance of our friends and all the parties concerned within or beyond our country. 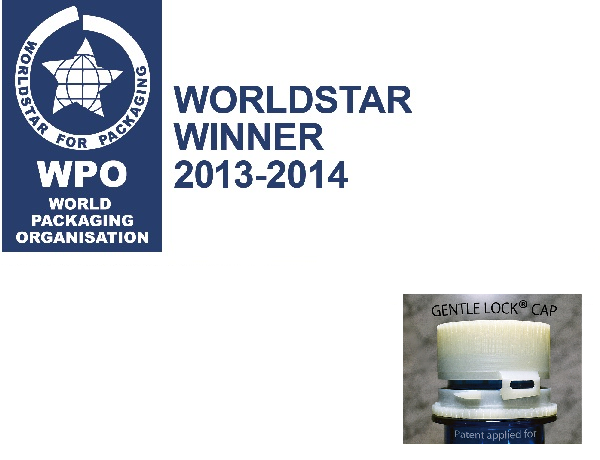 The WorldStars is the most important packaging award in the world, organized by WPO (World Packaging Organization).WorldStars are presented only to those packages which, having already won recognition in a national competition.The 2014 round was brought in 249 entries from 33 countries and announced 139 winners. The President's Award is the prestigious special awards and Gold Award is awarded to only one package among all WorldStar award winners. The picture above is linked to WPO's site. Medicines, Chemicals, especially those which require CR (Child Resistant) closures, Beverages (PET bottle), Seasonings, Cosmetics, Toiletries, Supplements, Detergents, Inflammable or Volatile Liquid (oil etc. ), Insecticides, Chemical Fertilizers. GentleLock Cap is a screw cap system of a new generation which prevents leaking on impact and is highly child-resistant. The cap is locked and unlocked by turning the ring under it in the same direction as to "close" the cap. Opening the locked cap requires two actions in opposite directions. The system will largely help prevent possible seismic fires caused by overturning of plastic tanks of oil and contamination of solutions at the medical front, as well as leakage of beverage or cosmetics while carrying. Accessible design is realized; lock status can easily be checked either by touching or seeing. Guidance about our patents & trademark licensing. 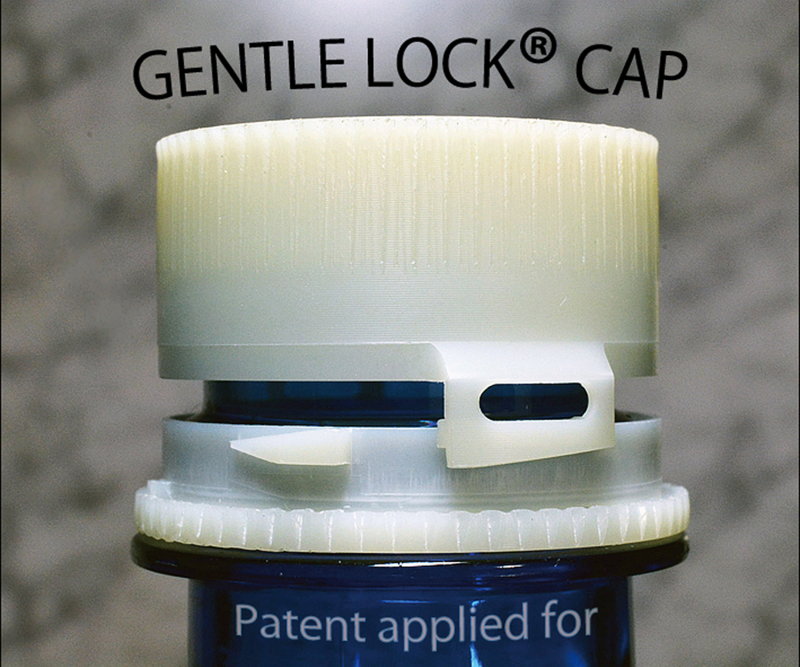 GentleLock®Cap is able to be applied to various screw caps for bottles and containers. We provide the license program on our patents for trial production, manufacture and sales. For details of programs, please make enquiries. The process for making contracts. * An example of NDA to exchange informationan is here. You can apply GentleLock® not only to screw caps but also to other various products such as lockable joints for tubes, detachable connectors for oscillation devices or others. We are planning to spread business with GentleLock® in varied fields aiming for 'Sanpou yoshi'. For any queries or requests regarding GentlLock, please do not hesitate to contact us by e-mail. We have another website "GentleLock.net" . If you are interested in our studies please visit there.